The Zildjian A Custom 18” EFX Crash Cymbal delivers fast dry trashy tone perfect for adding shimmering accents and punctuation to your pla.. The Zildjian A Custom 18” EFX Crash Cymbal delivers fast dry trashy tone perfect for adding shimmering accents and punctuation to your playing. Offering the perfect way to add some bright, trashy character to your cymbal set up, the A Custom EFX crash produces fast flashes of dry tone ideal for accents. With its striking cut out pattern, fast attack and short sustain, this effects crash delivers bursting sound ideal for rock, metal and all styles where you need to cut through the mix with ease. This Zildjian special effects crash cymbal features a unique set of laser generated cut outs which not only give it a striking appearance but also work to give the cymbal its trashy tone. The strategically placed holes and longer cut outs provide this 18” crash cymbal with a trashy dryness to its sound which gives it a unique and individual character. 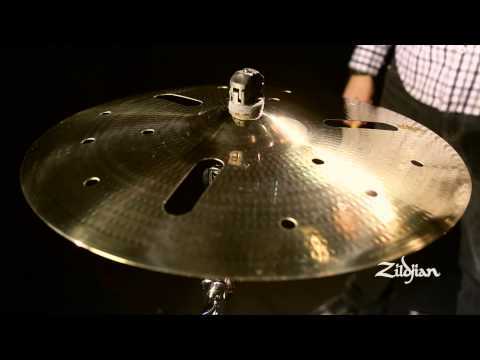 A great way to add a new and interesting sound source to your cymbal set up, this Zildjian A Custom EFX crash provides something outside of the traditional to help push your creative playing. Producing a beautifully trashy tone and dry character, this Zildjian crash has both a fast attack and a short sustain which allows it to deliver quick flashes of accenting tone. The thin weight of this crash cymbal allows it to burst into life quickly to produce instant shimmering tone for immediate accents. The short sustain helps to keep the sound of this cymbal to a neat and compact minimum ensuring it never outstays its welcome. The result is an effects cymbal that offers immediate impactful punch but fades fast to ensure a tidy sound. The ideal choice for fast flashes of dry tone, this 18” effects crash offers the perfect way to inject some trashy thwack into your playing. Not as bright as the 18” S Trash Crash but brighter than the 18” K EFX, the A Custom 18” EFX crash offers a happy medium between very bright and very dark. The brilliant finish and hammering technique typical of the A Custom range serve to ensure this 18” crash cymbal offers the shimmering tone and crisp sophisticated sound synonymous with this cymbal series. The bright bursting tone, compact sound and trashy character of this Zildjian EFX crash make it the ideal choice for adding interesting accents and punctuation to your playing. Combining fast attack and short sustain with a brilliant laser holed finish, the Zildjian A Custom 18” EFX crash delivers trashy, dry, compact flashes of accenting tone ideal for instances when you need to make an impact. For quick, compact, dry, trashy tone, buy the Zildjian A Custom 18” EFX Crash Cymbal now from Pro Music Tech Online!